In the range of single cup coffee makers, Tassimo coffee makers are at the high tech end. While Keurig coffee makers brew each k-cup in an identical manner, the Tassimo reads the barcode that comes on every T-disc, and then adjusts the brewing process - so the amount of water and temperature is perfectly controlled to suit the particular brand of coffee in the T-disc. 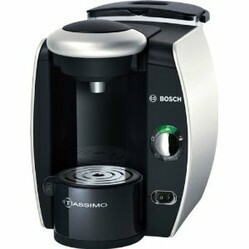 This page reviews the different Tassimo models so you can pick the one that suits you best. 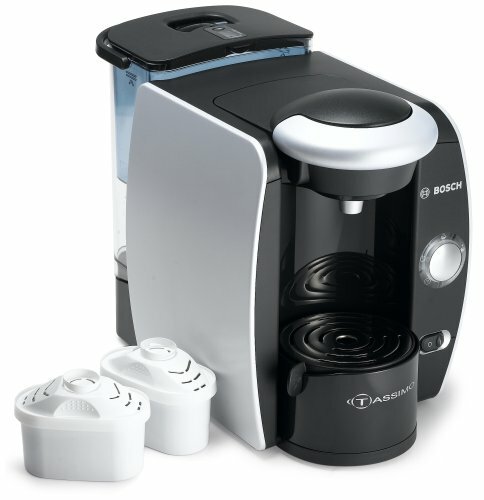 The Tassimo 65 has a removable 67 ounce water reservoir (about 8 cups). They include a Maeva water filter with it. It has an LCD display that announces each stage of the brewing process. There is a manual over-ride so that if you want to adjust the brewing process (more water/higher temperature) to something other than the optimal decided by the barcode, you can. It also has a stand-by mode to save electricity between making cups of coffee, and the cup stand is illuminated. This machine is also very quiet compared to the Keurig (a result of classic German engineering?). The Tassimo T45 is very similar to the T65, so it is easier to say what is different. The T45 does not have the illuminated stand and the LDC display is not as detailed (it doesn't take you through the brewing process for example), and it does not have the manual over-ride that the T65 has (to alter the brewing process). That's pretty much it, and accounts for the $30 difference in list price between the T65 and the T45. 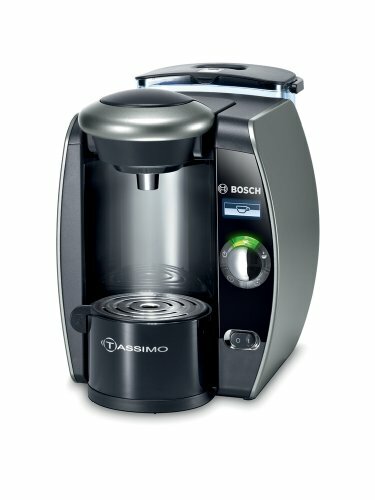 The Tassimo T20 has a 57 ounce reservoir (it's not quite a mini-brewer, it's just a little smaller than the others). The cup stand is adjustable and you can customise your coffee maker by purchasing color inserts to change the cup stand (the inserts have to be purchase separately - see right). Both the reservoir and drip tray are removable. Note that this machine is not programmable - you get the exact coffee as dictated by the bar code on the T-disc. Braun are another German manufacturer, who have ventured into the coffee maker market by licencing the Tassimo T-disc technology. As you can see, the design of the Braun is much sleeker and more pleasant to the eye than the Bosch machines. However it does take up more room on your kitchen counter. In terms of functionality, it operates in the same way as the Bosch T45. You may also like to look at the following pages on keurig coffee makers , other single serve coffee makers , best thermos bottles and stainless steel coffee presses..